For many, becoming self-employed requires entering new territory, especially when it comes to taxes. If you’re a freelancer or contract worker, provide a service in which a client pays you more than $600 per year, or you earn more than $10 in royalties per year, it’s possible you’ll receive a 1099-MISC form. 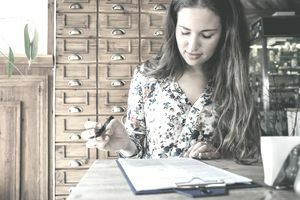 This form is similar to a W-2, in that it lists your earnings; but differs in that it’s designated for contract work or “miscellaneous” income, as opposed to employee income. You may not only receive a 1099-MISC but if you hire contractors in your business, you may need to send one if you paid a contractor more than $600 in fees during the tax year. Here are common questions and answers related to the 1099 -MISC. Please note, I’m not a tax expert, so contact a tax professional or the IRS for details. What’s on the 1099-MISC Form? Box 1: Rents - rent paid to you. Box 2: Royalties - Royalties paid to you. Box 3: Other income - Income earned from things like winning a prize. Box 4: Federal Income Tax Withheld - Usually, companies that take on contractors don’t withhold Federal Income tax, but on occasion, it can happen. For example, I worked for a sales company once that withheld Federal Income Tax, even though I was a contractor. Box 5: Fishing Boat Proceeds - Money earned from fishing. Box 6: Medical and Health Care Payments - Money you received to pay for health care. Box 7: Non-Employee Compensation - This is the box that you’re earnings for contract work will show up in. Box 8: Substitute Payments In Lieu of Dividends or Interest - Payments of $10 or more that you received instead of dividends or tax-exempt interest as a loan. Box 9: Payer Made Direct Sales of $5,000 or More - This box will be marked with an “X,” if you’ve made $5,000 or more in sales of consumer products for resale. If you’re involved in a direct sales company, this box may be checked. Box 10: Crop Insurance Proceeds- Income $600 or more paid to farmers by insurance companies, except under certain circumstances. Box 11: Foreign Tax Pad - Foreign tax paid on the income listed on the 1099. Box 13: Excess Golden Parachute Payments - Payments in excess of the allowable golden parachute amount. Box 15 a - b: Section 409A Deferrals - These boxes have to do with contributions to a section 409A retirement plan. Box 16: State Income Tax Withheld The next three boxes are not required and are provided as a convenience for tracking state income information. Box 17: State/Payer’s State No. How Do I Use the 1099-MISC Form I Receive? Similar to the W-2, you’ll enter information provided on the 1099-MISC on your tax return. If you’re a sole proprietor or a single-member limited liability company (LLC), you report 1099-MISC income on Schedule C - Profit or Loss from a Business. It is the form on which you’ll also report expenses related to your business. After completing Schedule C, you’ll transfer your net income or loss to your 1040 form. If you own a corporation, your business income is reported on the corporation’s tax return. Depending on what you do, you might receive several 1099-MISC forms. You can combine the income listed on each 1099-MISC onto a single Schedule C for a single business. That means if your 1099-MISC income is ALL related to your home business, you can list it on a single form. However, if you have several businesses, you’ll want to have a separate Schedule C for each. What If I Don’t Get a 1099-MISC Form? You are required to pay taxes on ALL income you earn, whether it’s reported on a 1099-MISC or not. For example, if you earned affiliate income from business A that is below the $600 threshold, you may not receive a 1099; however, you're still required to report it. Can I File 1099-MISC Income Through E-Filing? Yes. Just like traditional W-2 job filing, you can submit your yearly business tax return online. Home and business tax software will walk you through the process of submitting your 1099-MISC information and inputting the data on your Schedule C. If your business is a corporation, you can use business tax software to e-file your business tax return. How Do I Use the 1099-MISC Form If I Paid Contractors? If you paid more than $10 in royalties or $600 in fees, you’re ​required to send the person a 1099-MISC. The only exception is payments made to corporations or LLCs that operate like corporations and employees (there are a few other exceptions. You can read the IRS 1099-MISC Instructions for details - PDF). You’ll need to fill out the form, including your business name, address, and EIN, the payee’s (contractor’s) name and fill in the appropriate box with the income amount. For example, if you paid a virtual assistant $1,200, you’d fill that in box 7. Note, the IRS allows you to truncate the contractor’s social security on the form, but not your EIN or other identification number. You’re required to have the form to your contractor(s) by January 31st. You must send a copy to the IRS, as well.